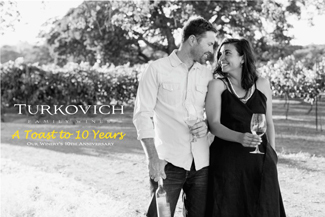 Comments: Surrounded by rich agricultural land and soaked in the warm California sun, Turkovich Family Wines produces quality small-lot wines from the best vineyards in Western Yolo County. Winemaker and third-generation farmer Christopher Turkovich returned to his hometown after traveling the world making wine. He jumped at the chance to return to his hometown and to make wine in Yolo County;an area still slightly undiscovered but with the potential of producing world-class wines. In 2007, he started the winery and planted the estate vineyard, which is located in the Winters, CA region, less than five miles from Napa County and a hidden gem for growing quality wine grapes. Expanses of golden rolling hills are dotted with patches of green oak trees and vineyards;and are tucked in against the Vaca Mountains. The great gravelly-clay-loam soils, along with warm days and temperate nights, assist the vines to produce excellent grapes. The Winters area features a unique convergence: where the delta breezes cease, they are met by cool winds sweeping down off Lake Berryessa, allowing for a long, mild growing season. The vineyards' ideal conditions make for rich fruit exhibiting bright, flavorful characteristics in the wines.